Retailer Land of Leather has called in administrators after attempts to sell the firm and raise extra money failed. The company said it had made every effort to cut costs but that market conditions remained tough and January sales had been "very disappointing". Talks with potential bidders ended in December after it said the offers gave "insufficient value" for shareholders. Land of Leather - which employs 850 people -issued three profit warnings in 2008 as sales slumped. The Kent-based firm said it had appointed Lee Manning and Nick Edwards of Deloitte as joint administrators. "The administrators are working closely with the management to protect the interests of customers who have paid deposits on furniture orders." "We have taken a number of steps both to protect customers and to inform them of how the administration affects their circumstances." All those who either paid a deposit by credit card or Visa debit card, or who have paid a deposit by any means since 26 December are fully protected, said Deloitte. Meanwhile customers who paid a deposit by cash or by a non-Visa debit card before 26 December will be offered a discount on other stock if their original order cannot be fulfilled. "However, it is the objective of the administrators to sell the business as a going concern and have all deposits honoured", added Deloitte. Stores are open for business as usual, but Deloitte is urging customers who have paid deposits to use the sales hotline, email enquiry address and website, rather than to visit the stores, unless they aim to pay the balance on goods ready for delivery. 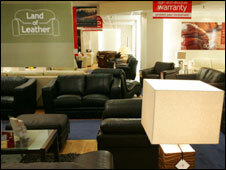 Consumers have been cutting their spending as a result of the economic slowdown, hitting sales of items such furniture. Last week rival Sofa Workshop said it had started steps to appoint administrators. Land of Leather has 109 stores in the UK and the Republic of Ireland.